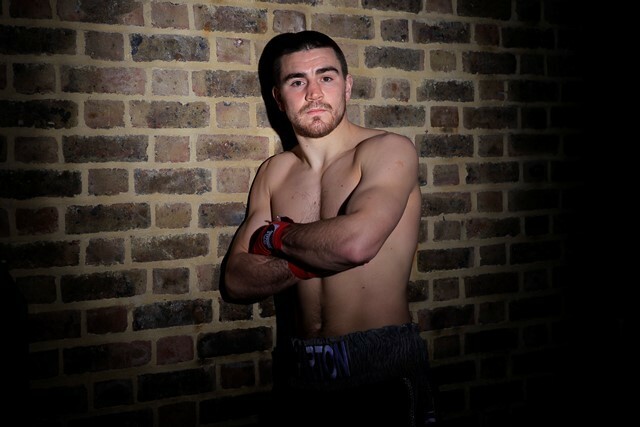 Feisty Peckham crowd pleaser Johnny Garton concedes he’s like a kid at Christmas. The man they call ‘The Pexican’ in honour of his rough and ready ring manner enjoys an unexpected berth on Hall of Fame promoter Frank Warren’s festive fiesta at London’s Copper Box Arena on December 9th. The 30 year old ex Southern Area and English champion contests the vacant IBF European title on the undercard of James DeGale and Lee Selby’s IBF world title defences and knows that an impressive victory is likely to cement a crack at the British title and a slot in the IBF world rankings. ‘Turning pro, I never thought I’d get anywhere near as far as I have,’ claims the chirpy south Londoner who has lost just once in 22 (7 early wins). With 10 defeats in 35 bouts and just a brace of South-East London Divisional titles to garnish his amateur CV, grafter Garton was a long shot to hit the heights when he entered the profession, well into his 25th year, back in October 2011. However, the free swinging slugger has made giant strides since trainer Al Smith convinced him that, in the austere world of paid prize fighting, it’s far more profitable to give than to receive. ‘As an amateur, a friend took me around loads of gyms to spar and I spent time at Al’s iBox gym, working with Bradley Skeete. In 2011, Al offered me a trial, I came through and signed to go pro with him,’ recalls Garton. ‘It’s such a brilliant gym to be a part of. Al lives for his boxing and all the lads do everything together; win, lose, laugh, socialise. It’s obligatory to turn up if a gym mate is boxing. We’re all very close. ‘Whereas I was about all out aggression in the amateurs, Al’s very defence minded and we’ve gradually reached a compromise that suits and succeeds. I still march forward but now I move me head….occasionally! The sole reverse in his six year paid career was a second round cuts loss to future British and European boss Sam Eggington in an April 2014 Prizefighter sprint. Suitably chastened, he listened, learned and recovered sufficiently to obtain and retain both the Southern Area and English 147lb titles between 2014-16. ‘On December 9th I hope to excite, do full justice to the ‘Pexican’ nickname that my fans have given me and strengthen my case for a British title fight early next year. That’s the plan!’ says Garton. ‘I’ve not fought since April so I just hope that whoever comes out of the opposite corner will stand and give me a right good scrap. Whenever there’s been a title on the line and the opposition brings a winning record and a bit of ambition, I win by stoppage. They take a few risks and I can ‘get hold of ‘em’!